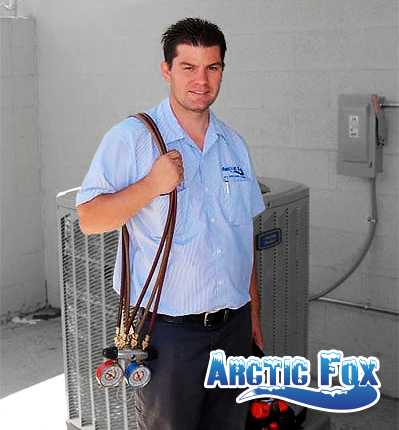 Arctic Fox Air Conditioning & Heating, LLC is a family-owned and operated business started by Heath and Misti Thomas in September of 2008 to provide exceptional HVAC installation and repair services for residents of the Peoria, Glendale and Greater Phoenix Area. Heath was mentored by his uncle starting in 1999. After developing a love for the HVAC industry, he decided to attend Universal Technical Institute graduating in 2000 in the top of his class. He went into the new construction field installing new air conditioning and heating units along with ductwork and water heaters. After a few years, Heath switched over to do repair and maintenance service learning that this was an area of HVAC that he loved doing. Occasionally, he would come across older units that needed to be replaced. With his previous experience of installing air conditioning and heating units, he was able to professionally and efficiently satisfy the needs of his customers. All of this experience has provided Heath with a very well rounded HVAC career. To add to his credentials, Heath was certified as a Master Heat Pump Technician in 2005 through the Phoenix Heat Pump Council. In addition, Arctic Fox Air Conditioning & Heating is an APS Qualified Contractor. Arctic Fox is also a Better Business Bureau Approved Business with an excellent rating. If your air conditioning, heating, water heater, or ductwork are in need of a professional touch, Arctic Fox is at your service. We work in the cities of Phoenix, Surprise, Glendale, Peoria, Avondale, and other West Valley Communities. Give us a call today at (623) 533-5718 or email us to schedule maintenance, installation, or repair services.